From baseball teams to magazines covering the funniest clips in all of sports, each of these organizations requires a handy sports WordPress theme to share schedules, post articles, discuss past games, and talk about videos. As you move through the list we’ve created here today, you’ll notice visual cues that belong in a sports stadium, with bold colors, strong fonts, and even some stock photos that correspond with popular sports. There are a lot of sports themes to choose from, so we want to guide your search and assist you in finding the perfect one for your current needs. 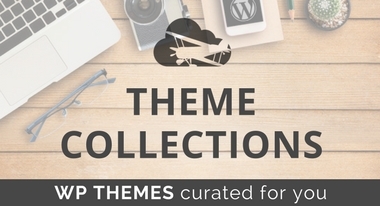 That’s why we’ve put together this theme collection. Whether you’re simply interested in displaying some photos of your little league team or you want to run a multi-author blog for sports news, we have something for you here. 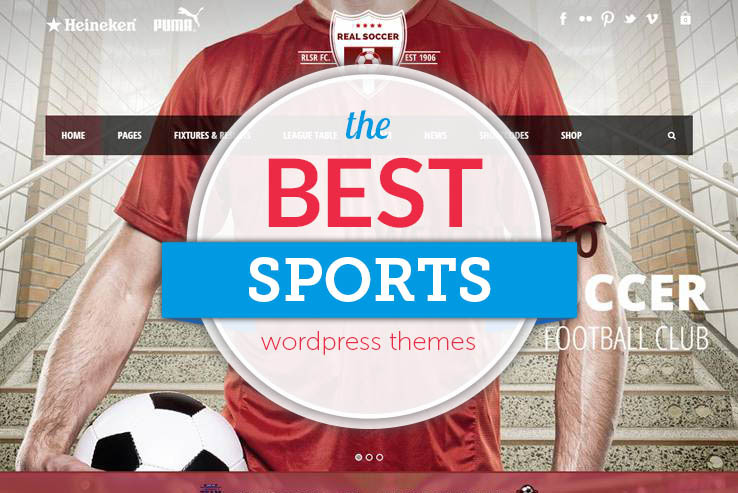 Unless you want to go the hand-coded route, a solid WordPress theme gives you a solid foundation on which to create a sports website. Start a sports news site, create a fan blog for your favorite team, develop a fitness club site—the sky’s the limit. So long as you have a high-quality theme in tow, you can make a real impression with your target audience. Continue reading to check out the top sports themes currently on the market. The Real Soccer theme is a great choice for soccer clubs and discussion groups, but any type of sport fits into the format. The main feature that stands out is the player profile and player list which allows for images, information, and buttons to explain their team roles. The results section helps you explain what users have missed with scores and other information, and the league table places all of the teams into different leagues or divisions. Match reports serve as a fun way to discuss what games are coming up in the future along with areas to analyze the matchups and show predictions on the future game outcomes. 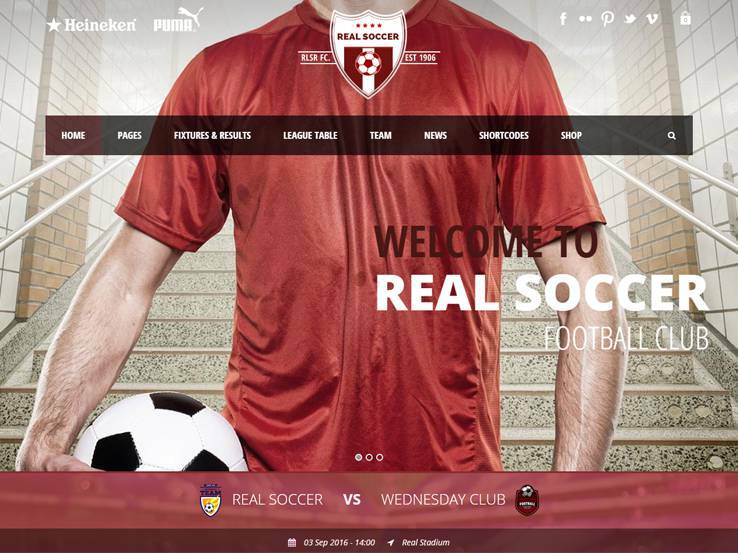 The Real Soccer theme has a prominent logo area, header, and slider for featuring your most recent content or a high-resolution image. Social media integration is incorporated to allow you to connect with your fans on different social media platforms. With Symetrio, you can build a website for any sport and choose from various different homepage and post layouts to meet your own demands. 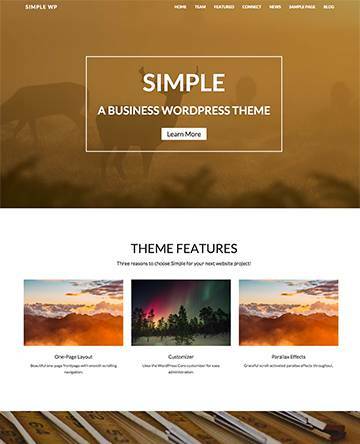 The theme includes an animated slider for your pictures as well as several shortcodes to keep your hands free of code and to add anything from buttons to columns. 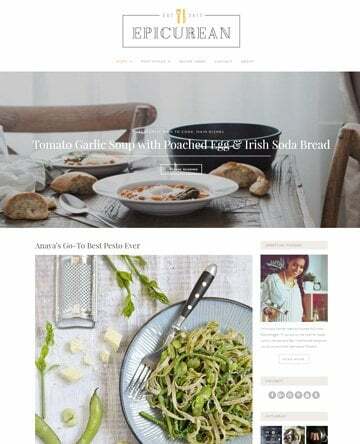 Add an integration with a shopping cart plugin, and create a fully functional blog. Other features include a parallax background, different widths, multi-site functionality, 37 amazing animation effects, and more. It even comes with a sporting event landing page for displaying a countdown timer to the start of the event. 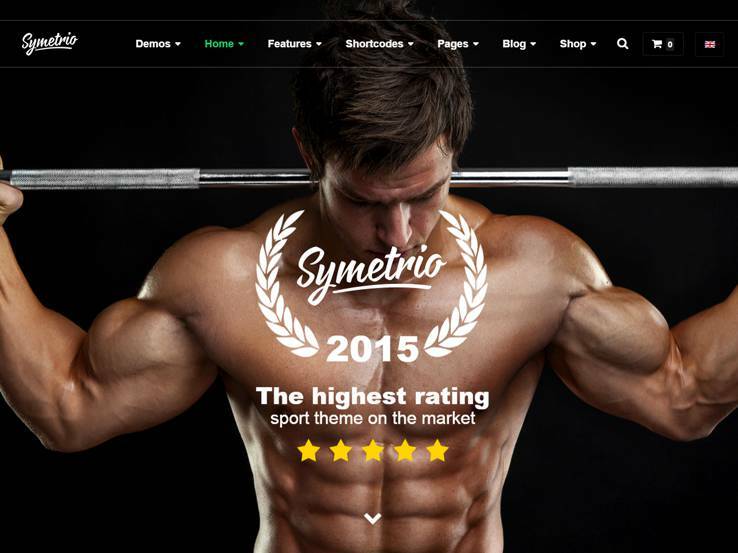 Symetrio is not only one of the highest rated sporting themes on the market, but it offers an insane amount of features to play around with. 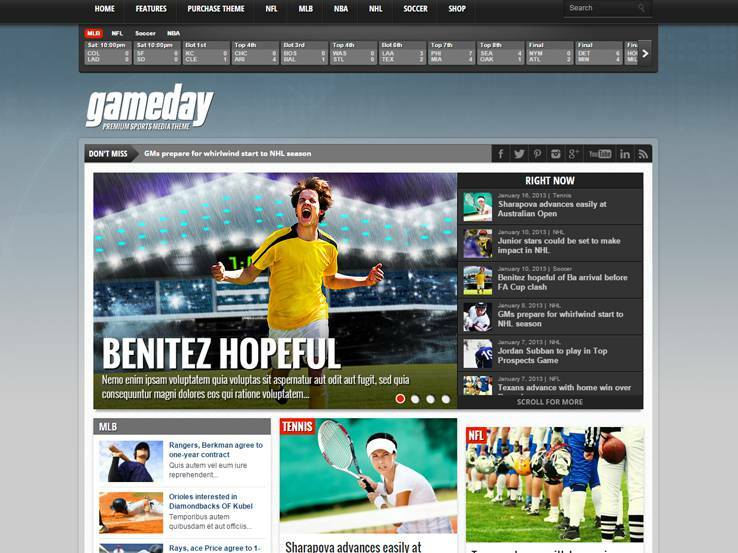 The Club Sports theme looks similar to the ESPN website since it displays scores and matchups at the top of the site, along with team management opportunities for webmasters. Club Sports integrates well with WooCommerce so you can sell sports-related merchandise and the player management allows you to feature all the members of your sports team. 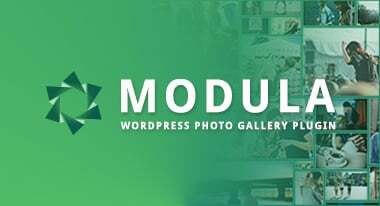 The gallery slider is a nice bonus for showing your coolest photos and the responsive nature of the theme ensures that anyone can view the site even on a mobile phone or tablet. Choose from several blog layouts and integrate your social media accounts by using the branded buttons that come with the theme. 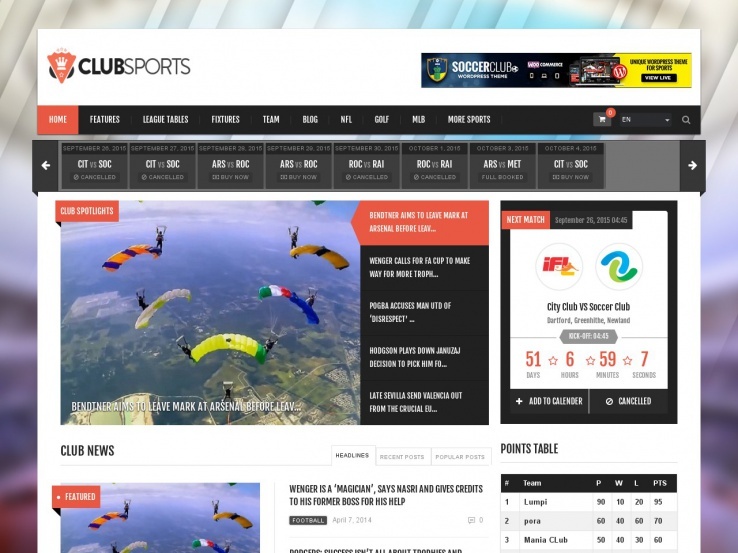 The Club Sports theme provides numerous widgets for incorporating anything from recent posts to a newsletter subscription form. When it’s time for game day, you need the Gameday theme. This gem has a responsive design for viewing on all devices and it’s WooCommerce ready for selling merchandise from your favorite teams. The custom built scoreboard is a must-have for any sports magazine and the flyout mobile navigation is a unique way to clear out the clutter on mobile devices. The different ad units allow you to monetize your website and the drag-and-drop homepage builder ensures that you don’t need a development degree to make your own website. Post and page slideshows allow for sharing high-resolution photos from your posts and the translation-ready nature of the Gameday theme helps you translate your website into another language. Try out the Balance WordPress theme if you’re interested in a sporting or fitness theme with strong email acquisition capabilities. 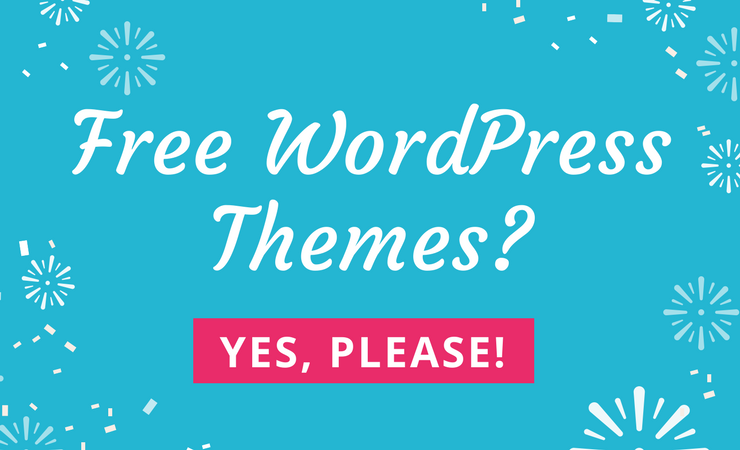 The theme includes four homepage variations and six sliders for the ultimate branding and you can implement an unlimited amount of sidebars to use all the real estate available. Notable features include 17 different page templates, six custom widgets, and six variations for the portfolio view. All of this allows you to create a truly unique website that stands out from the competition. The social media icons are nice for building your exposure and the integrated email signup form is designed to fit right in at the top of your homepage. Feel free to make a fully capable blog for boosting your search engine results and to give your readers valuable content. The GYM – Sport Fitness Bootstrap Theme includes the Visual Composer plugin which is a great way to keep your hands free of source code if you don’t have much experience with development. It also integrates with WooCommerce in case you plan on selling items for your sports teams. The multicolor options assist with branding and typography can also be customized on the backend of your website. The default layout is built for fitness clubs and trainers, but you can quickly change this to run a sports magazine or to feature content about your local team. The animated slider is a nice way to show promoted content and trainer pages are nice for those who plan on using the theme for a fitness group. 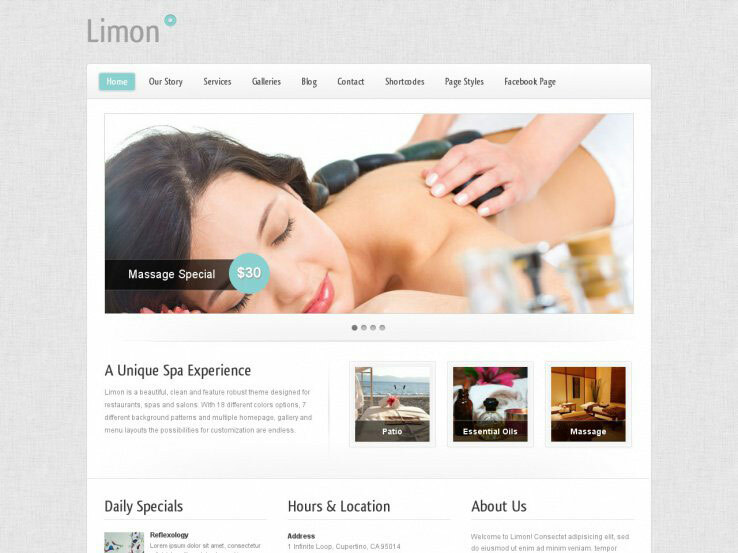 Limon – A Spa and Restaurant Theme is a great choice for those who want a sporty theme for a restaurant or spa. Since many spas provide sports amenities, it’s essential to include features for that as well. 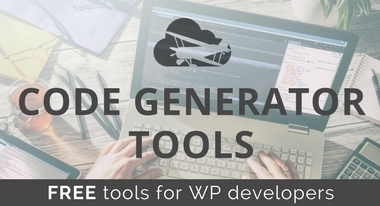 The theme includes custom widgets and a Facebook page to expand your presence and it comes with over 50 shortcodes for adding anything from buttons to columns without the need for development experience. Limon provides 18 different colors and seven backgrounds to choose from, meaning you can easily find a style that matches your brand. Galleries come in three variations and page styles are wonderful for giving your readers alternative formats to look at. 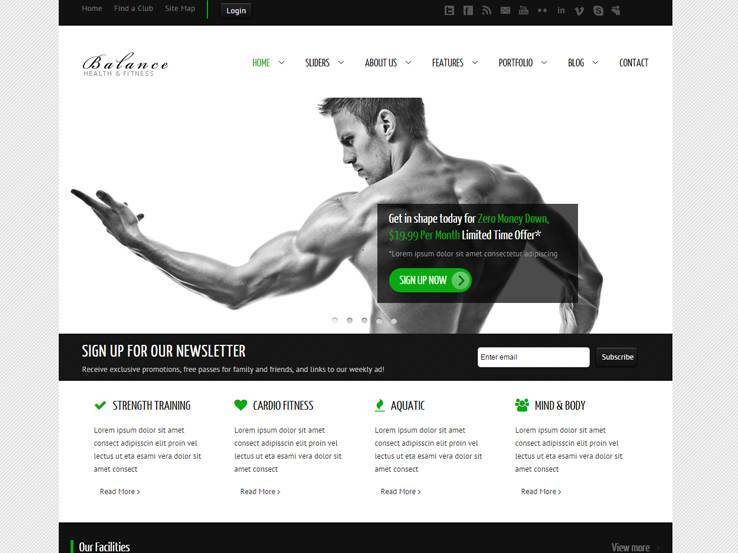 The Gym & Fitness theme, from Mojo Themes, introduces a stunning layout for sports, gym, and fitness buffs. The WooCommerce integration is just a starting point for making money down the road and the unlimited colors and layouts ensure that your site looks different from others who use the same theme. Both boxed and wide layouts are offered along with social icons which allow you to build your social media presence. With over 650 Google Fonts, you can’t go wrong with customizing your typography and a timetable feature is a way to show users how to stay healthy while traveling or while at home. A membership module also comes with your purchase, which is ideal for bringing in recurring revenue and instilling a sense of community on your website. 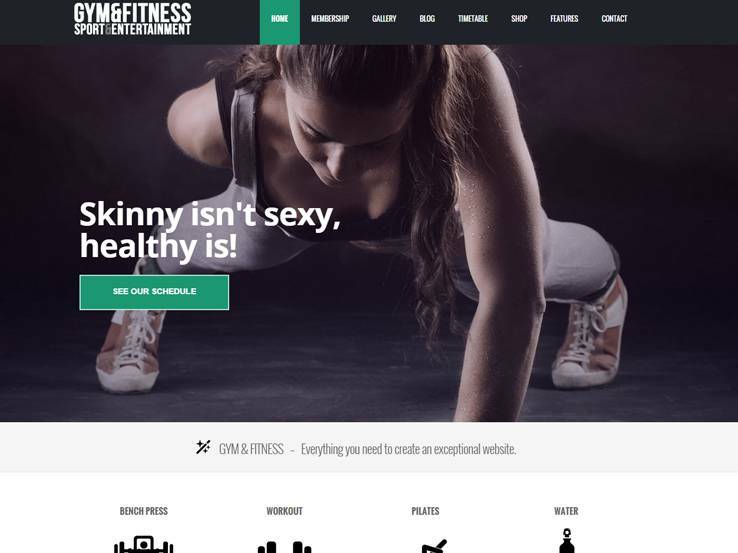 The Fitness Life – Gym/Fitness WordPress Theme offers a colorful theme with a large slider area for implementing text overlays and buttons to drive people to your promotions and booking pages. 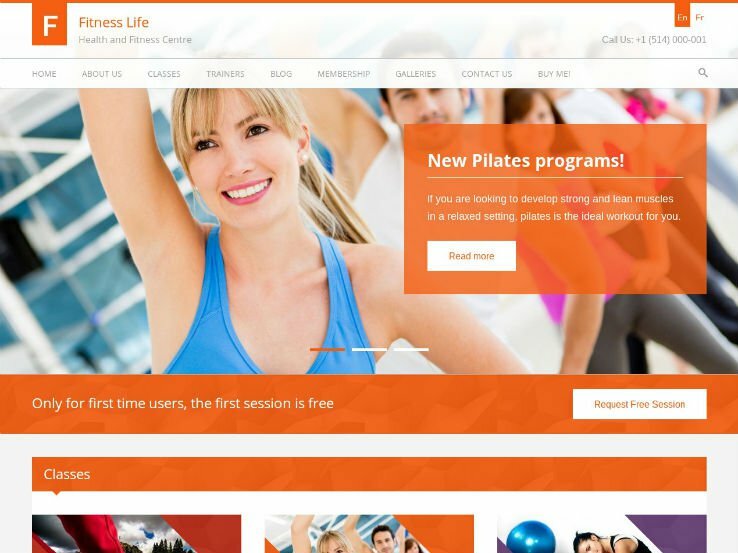 The dynamic and responsive theme works well for gyms, yoga studios, and trainers who want a theme that allows them to display and sell membership plan directly through the website. It has a prominent class signup option for generating more leads along with unlimited color schemes to implement your branding. Custom share buttons are included for expanding your reach through social media as well. 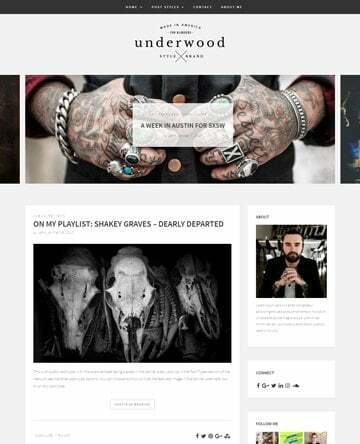 The theme has plenty of customization options, including four custom post types and nine widget areas. 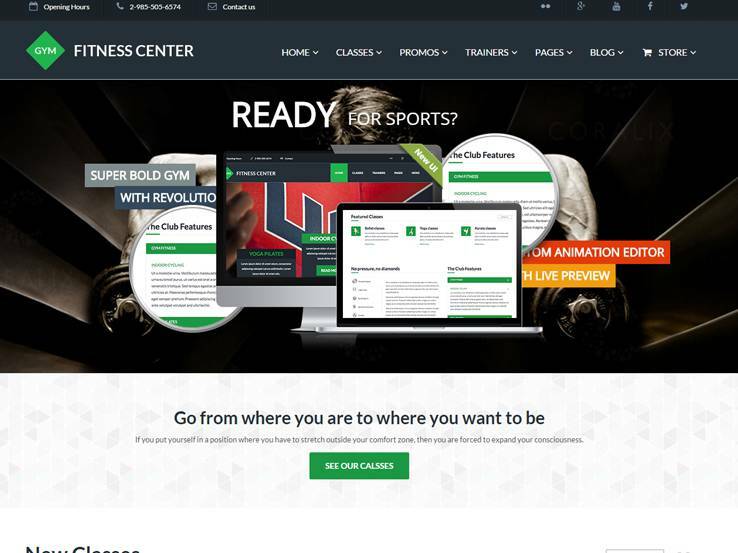 The multilingual ready nature of the Fitness Life – Gym/Fitness WordPress Theme means that you can reach a global audience. Create your own blog in order to boost your search engine rankings and to share valuable content with your users. Finally, the theme has various modules for featuring trainers, classes, testimonials, and more. The Fit+ theme is a multipurpose sports theme with a responsive design that looks wonderful on mobile devices. 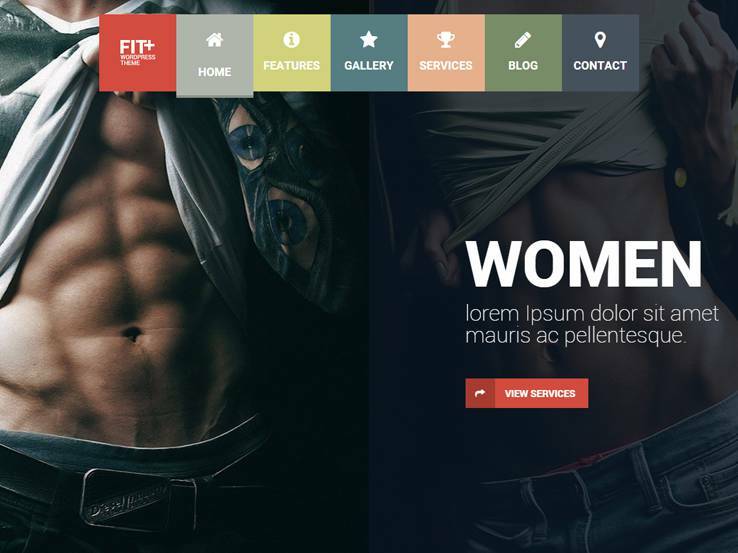 The modern nature of the Fit+ theme allows you to create a unique and visually appealing website that stands out from the competition. Choose from different color options for your branding purposes and use the full-screen portfolio to showcase work that you’ve done in the past. A full blog is provided and it comes with full-screen tools for pushing the limits in terms of modern design. The video background is one of our favorite parts of the Fit+ theme, since it allows you to immediately connect with your audience by sharing your mission. The Revolution Slider plugin is included with your purchase, with features that include animations and overlaying text, both of which come in handy for grabbing the attention and sending people to certain sales pages. 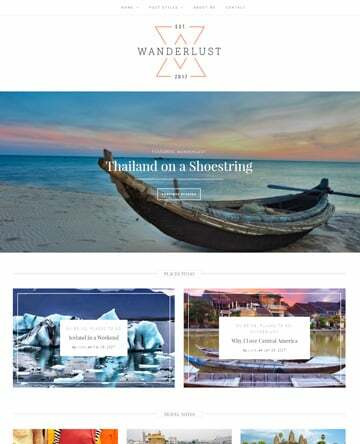 This powerful and flexible theme provides different templates for getting the design process started and it has translation files for reaching an international audience. This is particularly important for sporting websites since sports like soccer, basketball, and baseball are played all over the world. Google Fonts are provided to make your typography look great, while the navigational menu is colorful and sits towards the middle of the header which is a unique look compared to other themes. The homepage generally consists of a few large photos and links, which can send users to various other places. For example, you may separate the site into men’s and women’s sports and fitness services. Create a gallery with images of your sporting events and organize your blog posts into a horizontal slider so people can scroll through quickly to see which articles they want to read. 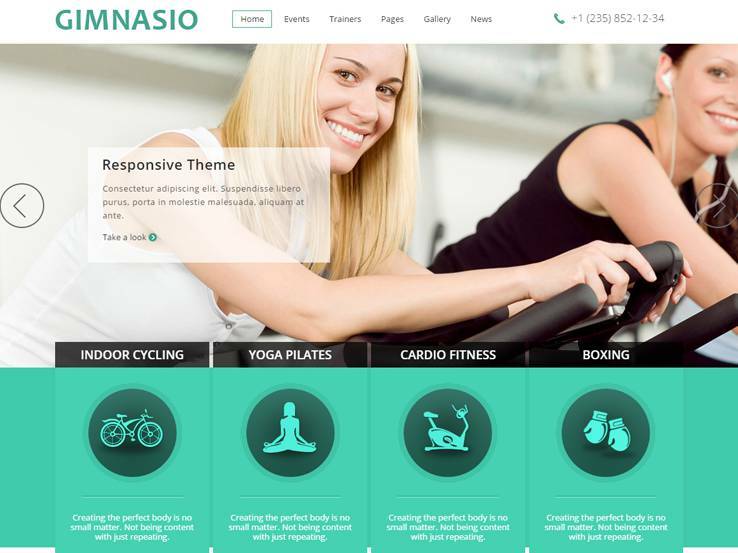 The Gimnasio theme has some handy tools to play around with if you’re looking to start a fitness or sporting website. Although you can use this for a wide variety of businesses, this theme is best for those who are running fitness centers. The responsive and retina-ready design looks great on smaller devices and people can access your events and classes from their phones while heading to the gym. The intelligent theme options panel provides different typography options for styling the site your own way. Localization is available to translate your website. Custom CSS modules are available for those who are more advanced in terms of development. Tons of shortcodes are available to add elements like columns, sliders, and toggles. Although beginners love these shortcodes, advanced users can use them as well to speed up the design process. Over 600 fonts are provided and custom backgrounds allow you to add your own style. The slider has text overlays and buttons so you can showcase events and promotions while the Trainers module gives you a chance to put a face to your gym and feature members of your staff. Your contact information is displayed right at the top to allow potential clients to easily get in touch with you. Showcase your services with icons and other visual elements and post testimonials from people who have lost a significant amount of weight since taking classes or working out at your gym. Post videos from your trainers and share information on your upcoming events. This is all available by using widgets. Along with galleries, newsletters signup forms and contact fields, the Gimnasio WordPress theme is one of the best out there. Evan Scoboria is the co-founder, and developer at Shea Media LLC, the team behind Nimbus Themes, this magazine, and a bunch of very happy clients. He co-founded Shea Media with his wife Kendall in 2009. Evan enjoys hunting, fishing, code, cycling, and most of all WordPress! This is a wonderful list but out of all these I particularly love the Evergreen Sports theme. You are right, Evergreen Sports is an excellent theme. Wonderful templates!!! Thxs!!! I like most the FITNESS FROM MOJO. Fitness looks like an innovative theme with lots of extra features. I agree it is up there with the best. Hi Ossie, Thanks for the suggestion. We will check it out. Are there themes for providing sports predictions? Thanks for the suggestion. We will check it out for a future update.